HG Tip: To make your donuts look extra beautiful, fill the donut cavities using a DIY piping bag. Just transfer the batter to a plastic bag, and squeeze it down toward a bottom corner. Snip off that corner with scissors, creating a small hole for piping. Ta-da! That's right. A batch of donuts that won't do you in. No, they're not fried in oil. 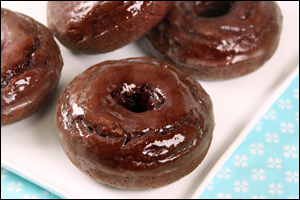 Yes, they're fudgy and glazed with delectable icing. And yes, they're as delicious as they look... Watch how they’re made! Preheat oven to 400 degrees. Spray a 6-cavity standard donut pan with nonstick spray. Bake until a toothpick inserted into a donut comes out mostly clean, about 12 minutes. Meanwhile, place a cooling rack over a baking sheet. Let donuts cool completely, about 10 minutes in the pan and 15 minutes on the cooling rack. In a medium bowl, combine glaze ingredients, and whisk until smooth and uniform.